If you&apos;re a fan of the great outdoors, we have some exciting news involving a few of our parks here in Hendricks County. There are two new programs being offered this summer by Hendricks County Parks & Recreation, as well as a new park opening up to the public in Brownsburg. If you enjoy hiking, disc golf, guided painting or just being outside, you&apos;re going to want to learn more about these excellent new opportunities beginning this weekend. Hendricks County Parks & Recreation is unveiling a new program this summer called the Ecohike Series. The first ecohike of the year is this Saturday at 1 p.m. at McCloud Nature Park, right outside of North Salem, and will be focused on spring wildflowers. On Saturday, ecohikers will join wildflower expert Norma Bangel Wallman and a Park Naturalist on a two-hour hike through McCloud Nature Park to learn about and locate wildflowers. Field guides will be provided, and participants are encouraged to bring their cameras and nature journals along on the hike. 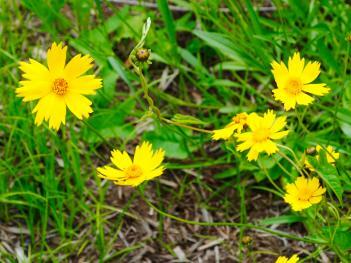 The Spring Wildflowers Ecohike on Saturday is the first of a four-part series designed for nature enthusiasts who are looking to delve a little deeper into our ecology than is normally presented at family programs. Two of the ecohikes will take place at McCloud Nature Park, and the other two will be held at Sodalis Nature Park outside of Plainfield. All four ecohikes are recommended for ages 16+, begin at 1 p.m. and last about two hours and are free to attend. Ecohikers do not need to participate in all four hikes -- simply attend the ones that interest you. For more information about the Ecohike Series, click here. Editor&apos;s Note: Due to all the rain and flooding, the grand opening for Northwest Community Park has been postponed to June 3. Bethesda Baptist Church in Brownsburg is opening its Northwest Community Park to the public on Saturday with a big grand opening event from 10 a.m. to 6:30 p.m. This park, located at 7950 N. County Road 650 East in Brownsburg, features a 3/4-mile walking path, an 18-hole disc golf course, a 3.5-acre fishing pond, a shelter house, flower gardens and a community garden. Playground equipment also will be added in the future. At the Northwest Community Park Grand Opening on Saturday, there will be inflatables, a family scavenger hunt, food trucks and other activities. A disc golf tournament for middle school and high school students will take place at 11 a.m. -- no experience needed. Learn how to play disc golf while you&apos;re there, and stick around for a movie in the park at 6:30 p.m. The festivities continue on Sunday at noon with a cookout, followed by a disc golf tournament for experienced disc golfers hosted by the Hendricks County Disc Golf Club. Those interested in participating in the tournament can do so for free. A player meeting will be held at 12:45 p.m., and the tournament tees off at 1 p.m.
For more information about the Northwest Community Park, click here. For those who enjoy paint &apos;n sip parties and other similar painting experiences where an instructor helps those of all skill levels paint their own masterpieces, Hendricks County Parks & Recreation has a new program for you: Plein Air Painting. The parks department is teaming up with local artist Rachel Davis of The Purple Palette to bring that step-by-step painting that you love to the outdoors at McCloud Nature Park and Sodalis Nature Park on four different occasions this summer. 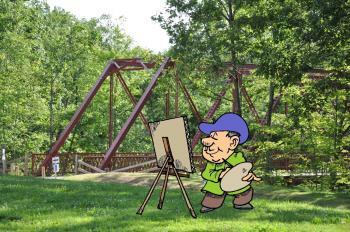 The term “plein air” comes from the French phrase en plein air, meaning “in open air.” Immerse yourself in the therapeutic benefits of fresh air and natural beauty of our parks while you create a masterpiece on canvas in the great outdoors! Rachel brings all of the necessary art supplies to the parks, she guides participants of all (or no) experience as you paint, a Park Naturalist gives you some insight into what you&apos;re painting while you work and you take home a unique conversation piece and work of art! All you have to do is register in advance and then bring yourself to the park! Plein Air Painting is $30 a person per event, and advance registration is required. All programs begin at 10 a.m. and last about two hours. To learn more about this new program, including how to register for any or all of the dates, click here. These three exciting new additions to our parks community provide even more great reasons to visit Hendricks County. Take a hike, play some disc golf and paint a gorgeous masterpiece with us this summer!